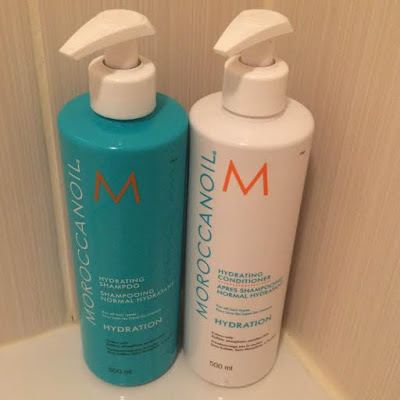 The Moroccan Oil shampoo and conditioner are products I've been desperate to try for ages, but have never got round to actually purchasing, so when I was last in my hairdresser's, I decided to go for it, and I'm so glad I did. My hairdresser spoke to me about this shampoo and conditioner and explained how best to use it, advising me that two pumps of the shampoo is enough to cleanse the hair for one wash (I tend to wash my hair at least twice at one time). My hairdresser also told me that the Moroccan Oil shampoo does not contain any sulphates or parabens, hence the reason when using the shampoo that it does not lather up, as most of us are so used to when washing our hair. I have now been using this shampoo and conditioner on and off for the last month, and really love it as I thought I would. It has the typical Moroccan Oil smell that I'm so used to from using the oil, and makes my hair feel really lovely and soft once I've dried my hair after usage. As my hairdresser suggested, I use two pumps for each wash, the first wash doesn't lather at all, but once you move onto the second wash, it will lather up slightly, however you can be assured that the shampoo is doing its job and getting your hair squeaky clean! I then move on to taking two pumps of the conditioner and working that through my hair. After, I then rub the Moroccan Oil Treatment through towel dried hair, and blow dry. I end up with fabulously smooth looking and smelling hair! The Moroccan Oil shampoo and conditioner retails most places for around the £39 mark, slightly pricey, but so worth it, I can guarantee you!